Our company does outdoor construction and paving work, including everything from stone walkways and brick driveways to outdoor swimming pool decks and backyard fire pits. With affordable prices, a long list of services, and one of the most skilled and experienced landscaping teams in the state, we’re proud to be able to call ourselves the best local option for outdoor construction and design. With a roster of professionals in a number of construction and landscaping fields, our team is equipped to see the big picture when looking at your property. Rather than just putting in a new driveway or reshaping the deck around your pool, our team can help you design each part of your landscape to complement every other part, and to prevent potential mishaps and inconveniences. An eye for aesthetics, and for utility. 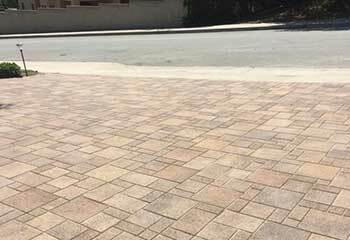 The most basic features our team can add, remove, and modify for you are paved features like driveways, concrete walkways, and courtyards, but that’s only the beginning. Things like stone columns, raised walkways and flagstone patios are entirely doable. Decorative water features like abstract fountains and fire utilizing structures like grill tables and BBQ islands all fall within our purview. In addition to construction and remodeling work, our company also provides cleaning services for stained or oil slicked pavements. Open spaces to walk, sit down, or keep flowerpots in are a great asset to a property of any size. Our team can install paved or flagstone patios, complete with walls and raised gazebo roofs if so desired, and we also offer repair and remodeling services for preexisting verandas and courtyards. If you’d like your patio further embellished with water features, decorative stone borders, or any other extras, just let us know what you have in mind, and our team will help you design just the space you want. For any modern home or business owner, there’s no more important landscape feature than a driveway and parking area. Driveways are often boring or even ugly asphalt tracks cutting across the ground, but with a little creativity and a few extra materials, our team can pave one that actually complements your property’s aesthetic with paving stones, bricks, stamped concrete, and the like. 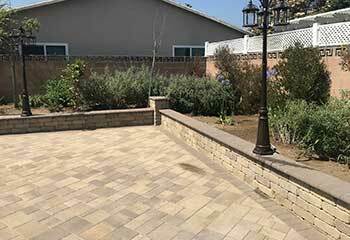 In addition to building and repairing these outdoor sections, our team can also fix damage done to your pavement or borders by erosion, rain, or the wear and tear of daily traffic, as well as remove unsightly oil stains. From decorative fountains and fishponds to outdoor hot tubs and full-sized swimming pools, water features can make incredible additions to any yard, garden, or park. Any good water feature will require a circulation system as well as a basin to prevent stagnant water from being a problem, and a raised pool or fountain requires a high seal around it. Swimming pools, of course, need surrounding decks to keep the water away from dirt and to provide space for swimmers to get in and out without slipping. Our team can handle all of the above. Adding a wall or a set of columns to your property can serve a purely decorative function, or they can support entire outbuildings, or block areas off from one another where needed. Cement, brick, and stone are all fine options for outdoor construction, but many property owners also like their walls lined with sheetrock or other decorative surface materials. Some good walls can reinforce your larger features, protect your property from intruders, or simply keep walkers and drivers from getting off the beaten path. “Barbecue pit” sounds like a simple, self-evident construction, but there are more options available than what people may realize. While a stone-lined pit or a raised outdoor oven or grill is a given, you may want to also build an island of kitchen counters and storage spaces near it, perhaps with running water and electricity to make cooking outside that much easier. With the addition of tables, benches, and sheltering roofs in case of rain, you can have an entire outdoor kitchen and dining room setup usable all year round. Want to see how our team helped other property owners? Then check out our latest projects. In his pursuit of a perfect looking driveway, this customer asked us to help seal the pavers. Read more here. This customer wanted to add an outdoor kitchen to his patio. Click here to read our project report. 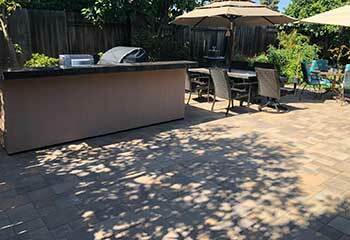 Find out how our team helped this customer change his patio floor using brick pavers. Just wanted to tell you how happy we are with your company. Our newly paved patio looks stunning and we've been really enjoying spending time there. Thanks a lot for all your help! Our new backyard flagstone patio was a great hit at our party last week and I wanted to let you know that it got lots of compliments (brace yourselves, calls are coming)! I am just loving my new paver patio! Thanks for doing such a great job with the installation. Your work is amazing and I’ve already had neighbors ask me for your company's number.